You have to admire the MINI brand. What started out as the 'new' MINI back in 2001 has expanded into a range of models including the Clubman, the Roadster and the Countryman. The latter raised a few eyebrows when it was unveiled and hasn't proved universally popular among the critics, while public opinion seems divided. But as part of BMW, it's obvious MINI was never going to be content with just one model. And now amazingly MINI is launching its seventh model. Called the Paceman it's a sort of coupe-like three-door version of the Countryman. You'd think that already existed - it's called the standard MINI - but apparently not. That said the Paceman is notably larger than a MINI hatchback and almost as long as a Volkswagen Scirocco. Sadly it's not much of a looker. Of course beauty is in the eye of the beholder but the Paceman is unlikely to be viewed by many as a handsome car. It has the same front end as the Countryman with the big headlights and high bonnet, but it's very different at the back with a sloping roofline and - for the first time on a MINI - lights that stretch horizontally rather then vertical. 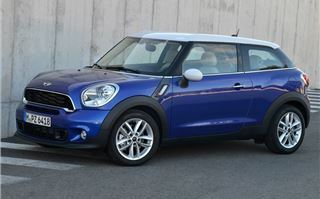 It's certainly an interesting take on the MINI style but compared to the standard hatch it looks bulky and bloated. There's better news inside though. The Paceman continues with the unique MINI interior design with that nice touch of retro about it. The huge dinner plate-sized speedo dominates the cabin and if you choose the optional sat nav system this is where the screen is located. It's a nice design touch but in reality you're more like to use the digital speedo displayed in the rev counter on the steering column. The circular design theme extends throughout with elements like the round air vents and door handles. The quality of the materials used is of a good standard but there are a few areas which let it down like the door tops and if you prod the centre stack around the air conditioning controls you'll find it flimsy. Not what you'd expect on a supposedly 'premium' car. On the plus side there is good room for the driver and front passenger, particularly in terms of elbow space. However the back is more cramped while getting to the rear seats isn't that easy, although it never is with a three-door car. In the back you'll find reasonable head room but the same can't be said for legroom which is limited. MINI says there's the same rear space as the Countryman but in reality it's considerably less. There are two individual back seats divided by MINI's central rail system which includes a series of cup and sunglasses holders that can be moved along. Again it's a neat design but not that practical and there's no three-seat bench option. The boot is a decent size though and with 330 litres it has more luggage room than most small Fiesta-sized hatchbacks plus the back seats fold forward. The ride is pretty firm, as you'd expect from a 'sporty' coupe, and at times it's somewhat unsettled. As standard MINI has fitted the Paceman with the sports suspension from the Countryman, along with a 10mm lower ride height and you certainly notice it. You can however opt for standard suspension and ride height as a no cost option. If you want comfort this is the better choice. The Paceman range features the familiar MINI engine line up. There's the Cooper, Cooper S and Cooper D which are all powered by a 1.6-litre engine. The Cooper SD gets a 2.0-litre diesel with and 143PS and 305Nm of torque. ALL4 four-wheel drive is also available on all models bar the Cooper plus there's a JCW version of the Paceman in the pipeline. If it's economy you're after then the Cooper D is the model to choose. We weren't able to test this but if the Countryman is anything to go by, the 112PS unit should offer decent performance and good pulling power. But the best part is an official economy figure of 64.2mpg with CO2 of just 115g/km. Not all the engines are as efficient though and choosing an automatic gearbox severely hampers economy. Available on all engines, the six-speed automatic makes economy drop dramatically and CO2 rise accordingly. A surprise given most modern automatics are now more efficient than their manual equivalents. We got to drive the Cooper S in standard front-wheel drive with the six-speed manual. It's a great engine and perfectly suited to the MINI image. The turbocharged unit has plenty of zest and pulls well from low revs too so you don't have to work it hard to enjoy the performance. On paper it will do 0-62mph in 7.5 seconds and it feels suitably nippy. It will happily rev up to the red line but remains refined and never sounds stressed. There's a nice exhaust note too although it does pop and burble when you come off the power, even if you're just driving gently, which soon becomes annoying. The Paceman is a bit of an odd one. It's not clear who it's aimed at or who the typical buyer will be. Then again the same was said of the Countryman and there are no shortage of those on the roads. The MINI image counts for a lot and it's this that will have much appeal. 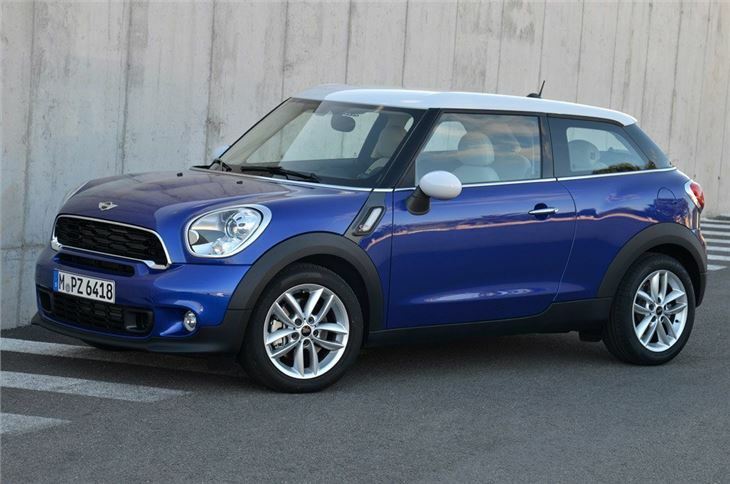 It has plenty of MINI character about it and although the Paceman is not especially attractive, it's good to drive and more practical than a MINI hatch. However, for our money we'd stick with the better looking and cheaper standard MINI.